'A comprehensive and important collection that includes essays by some of the leading figures in the field. …Essential reading for anyone interested in risk assessment.' Professor Kristin Shrader-Frechette, University of Notre Dame 'The editors are to be congratulated for bringing together a distinguished international group of theorists to reflect on the issues. This volume will be sure to raise the level of debate while at the same time showing the importance of philosophical reflection in approaches to the problems of the age.' 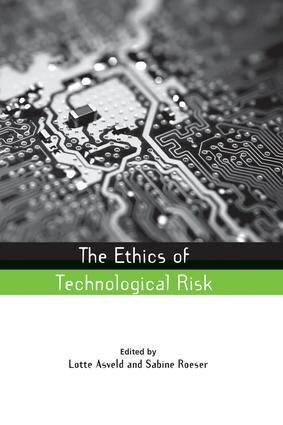 Professor Jonathan Wolff, University College London This volume brings together top authors from the fields of risk, philosophy, social sciences and psychology to address the issue of how we should decide how far technological risks are morally acceptable or not. The underlying principles are examined, along with methodological challenges, public involvement and instruments for democratization. A strong theoretical basis is complemented by a range of case studies from some of the most contentious areas, including medical ethics and GM crops. This book is a vital new resource for researchers, students and anyone concerned that traditional approaches to risk management don't adequately address ethical considerations. Sabine Roeser is an assistant professor at the Department of Philosophy, Delft University of Technology. She has published articles and edited books in the areas of moral philosophy, risk and emotion. Lotte Asveld currently works at the Dutch Institute for Technology Assessment, the Rathenau Institute in The Hague. The Earthscan Risk in Society series publishes high quality research, teaching, practical and policy- related books on topics that address risk analysis, risk assessment, risk perception, risk management, uncertainty and decision-making in society. Professor Ragnar Lofstedt is the series editor and the series has published highly influential authors in the field of risk, including Ortwin Renn, Baruch Fischhoff and Paul Slovic.